Divergent plate boundaries, such as the one crossing Iceland, are characterized by a high density of subparallel volcanic fissures and tectonic fractures, collectively termed rift zones, or fissure swarms when extending from a specific volcano. Volcanic fissures and tectonic fractures in the fissure swarms are formed during rifting events, when magma intrudes fractures to form dikes and even feeds fissure eruptions. We mapped volcanic fissures and tectonic fractures in a part of the divergent plate boundary in northern Iceland. The study area is ~1,800 km2, located within and north of the Askja central volcano. The style of fractures changes with distance from Askja. Close to Askja the swarm is dominated by eruptive fissures. The proportion of tectonic fractures gets larger with distance from Askja. This may indicate that magma pressure is generally higher in dikes close to Askja than farther away from it. Volcanic fissures and tectonic fractures are either oriented away from or concentric with the 3–4 identified calderas in Askja. The average azimuth of fissures and fractures in the area deviates significantly from the azimuth perpendicular to the direction of plate velocity. As this deviation decreases gradually northward, we suggest that the effect of the triple junction of the North American, Eurasian and the Hreppar microplate is a likely cause for this deviation. Shallow, tectonic earthquakes in the vicinity of Askja are often located in a relatively unfractured area between the fissure swarms of Askja and Kverkfjöll. These earthquakes are associated with strike-slip faulting according to fault plane solutions. 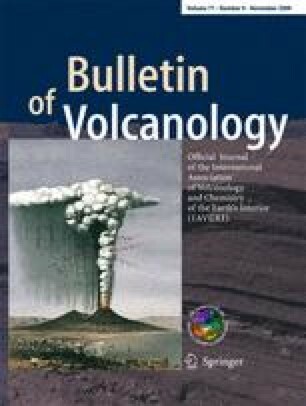 We suggest that the latest magma intrusions into either the Askja or the Kverkfjöll fissure swarms rotated the maximum stress axis from being vertical to horizontal, causing the formation of strike-slip faults instead of the dilatational fractures related to the fissure swarms. The activity in different parts of the Askja fissure swarm is uneven in time and switches between subswarms, as shown by a fissure swarm that is exposed in an early Holocene lava NW of Herðubreið but disappears under a younger (3500–4500 BP) lava flow. We suggest that the location of inflation centres in Askja central volcano controls into which part of the Askja fissure swarm a dike propagates. The size and amount of fractures in the Kollóttadyngja lava shield decrease with increasing elevation. We suggest that this occurred as the depth to the propagating dike(s) was greater under central Kollóttadyngja than under its flanks, due to topography. The online version of this article (doi: 10.1007/s00445-009-0282-x) contains supplementary material, which is available to authorized users. We thank Guðmundur E. Sigvaldason, who sadly passed away at early stages of this project, as well as Erik Sturkell and Halldór Ólafsson from the Institute of Earth Sciences, University of Iceland, for their help with the fieldwork and their constructive comments. We would also like to express our gratitude to Kristján Sæmundsson for fruitful discussions. Thanks are due to Rósa Ólafsdóttir from the Institute of Earth Sciences who provided contour lines as well as the outlines of many lava flows in the research area, and Gunnar B. Guðmundsson from the Icelandic Meteorological Office, who provided data on the seismic activity in the area. We are grateful for the help with the ArcInfo software received from Hulda Axelsdóttir, then a student at the University of Iceland, and Bjarki Þór Kjartansson from the Agricultural University of Iceland, who also provided satellite images. Thanks are also due to Bryndís Brandsdóttir, who provided SPOT5 images. We thank V. Acocella and J. Stock for their constructive reviews, and H. Delgado Granados for his editorial help. This project was supported by the Icelandic Research Fund for Graduate Students (Rannsóknarnámssjóður) and the National Power Company (Landsvirkjun).